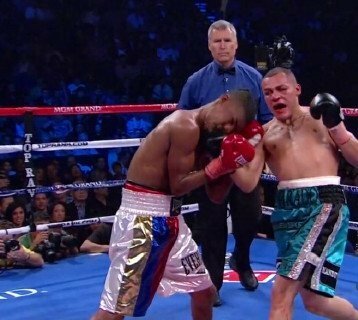 By Marcus Richardson: The October 13th clash between unbeaten light welterweight contender Mike Alvarado (33-0, 23 KO’s) and former WBA World lightweight champion Brandon Rios (30-0-1, 22 KO’s) promises to be an exciting one when the two fighters mix it up on the undercard of the Toshiaki Nishioka vs. Nonito Donaire fight at the Home Depot Center, in Carson, California. Both Alvarado and Rios are hard hitters that constantly come forward trying to land knockout shots with every punch. Rios might be at a little disadvantage in this fight in that he’s moving up from lightweight to take it, and he’s not looked really good for some time. Rios could be biting off more than he can chew by fighting the all action Alvarado, because this is a guy that has torn pretty much everyone apart that he’s faced thus far. It’s possible that this fight could live up to the billing, but for that to happen Rios is going to have to raise his game considerably from his last two outings. He’s blamed his less than spectacular performances on him having problems making weight. That sounds like a reasonable excuse but he’s going to have to up his game none the less. At this point there’s a question of whether Rios can even make 140 without a great struggle because it’s only five pounds more than the weight class that Rios has been having big problems with. He’s just someone that might be better off fighting at welterweight rather than light welterweight, because I have a feeling that Rios will struggle with this weight as well. It will give him another excuse should he look terrible again and get another controversial decision like he did in his last fight against Richard Abril last April. But I don’t think boxing fans are buying Rios’ excuses anymore. If he can’t the weight or if it’s hurting to have to dehydrate down then he’s going to have to move up another division to welterweight.